Fevers are often continual, with irregular spikes and associated chills and paroxysms. Patients with severe falciparum malaria may disclose central nervous system changes (prostration, convulsions, and impaired consciousness) and develop respiratory distress, abnormal bleeding, and circulatory collapse. Fatigue and malaise are nonspecific symptoms of malaria. These are in part caused by hypoglycemia and anemia. Hypoglycemia results from both decreased oral intake during illness and plasmodial use of blood glucose by the Embden-Meyerhof pathway. Anemia results from parasite-associated hemolysis and in some instances disseminated intravascular coagulation. 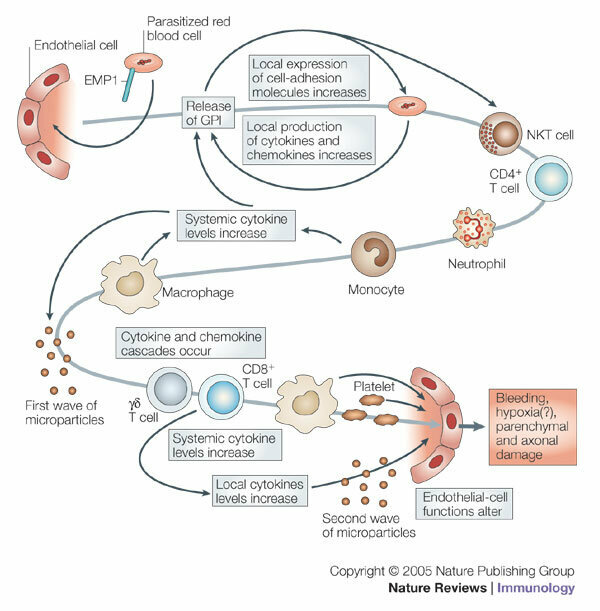 Plasmodium infections cause elevated tumor necrosis factor alpha (TNF-a) levels, particularly in individuals with severe disease. This may also contribute to hypoglycemia and anemia. In situations of hyperparasitemia, intra- and extravascular hemolysis may be severe. Excessive hemolysis and hepatic involvement cause hyperbilirubinemia and jaundice. Free hemoglobin, bilirubin, and malarial pigment are excreted and turn the urine brown to black. This manifestation, although not limited to P falciparum malaria, is termed "blackwater fever." 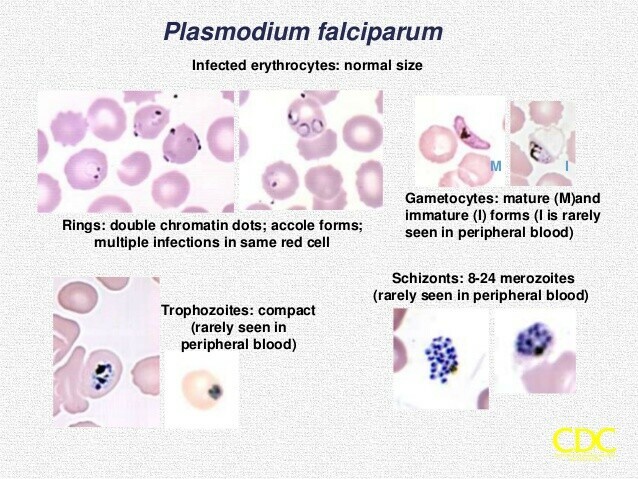 Falciparum malaria, particularly in the nonimmune, constitutes a medical emergency. Although patients with hyperparasitemia have high mortality rates, even those with parasitemias < 5% may suffer severe morbidity and death. Fatalities result from the immediate effects and sequelae of microvascular obstruction and extensive hemolysis. The microvascular obstruction is caused by specific cytoadherence between P falciparum-parasitized RBCs and endothelial cells. Obstruction of the cerebral vasculature is the most serious manifestation and may cause mental status changes that range from mild confusion to coma. Similar microvascular compromise in various organ systems may result in renal failure, noncardiogenic pulmonary edema, or gastroenteritis. Three thick blood smears (see above), spaced ~ 12 h apart, should detect any of the Plasmodium species. High levels of parasitemia in patients infected by P falciparum may be obvious in peripheral blood smears examined secondary to an abnormal hematopoietic profile. In such instances, a microbiologist or pathologist with expertise in infectious disease pathology should examine the peripheral smear and determine which of the Plasmodium species is present. It should be remembered that the routine Wright stain, which is used in many institutions for the peripheral blood smear exam, is not pH balanced and may not disclose the eosinophilic stippling in P vivax- or P ovale-infected RBCs. Harbingers of a poor prognosis present in the thin smear include hyperparasitemia, the presence of mature plasmodial forms (indicative of a larger sequestered biomass of parasites), and a high proportion (> 5%) of polymorphonuclear leukocytes which contain phagocytosed malarial pigment (indicative of recent schizogony). Other laboratory findings are nonspecific and reflect the specific organ involvement. Blood smears may disclose RBC fragmentation, reflecting the hemolytic process. Similarly, the urine may be dark in color, and hemoglobin and bilirubin may be detected. Other abnormal indices may be present in the urinalysis, depending on the severity of renal involvement. Hyperbilirubinemia may be present depending on hepatic involvement and the duration and severity of disease. Abnormal coagulation studies, including decreased fibrinogen levels, elevated D-dimers, and thrombocytopenia, may be present in patients with disseminated intravascular coagulation. Blood gas analysis may reveal hypoxemia, depending on the severity of pulmonary edema and the presence of hyaline membrane disease. Computed tomography or magnetic resonance imaging may be performed if mental status changes are present. These may reveal evidence of ischemic injury or edema and nonspecific changes. The microvascular congestion, secondary to adhesion between parasitized RBCs and endothelial cells, results in protean clinical manifestations. Complications generally occur in the tissues most sensitive to hypoxia and ischemia. Alterations in cerebral blood flow cause mental status changes, including disorientation, headache, coma, and death. Hepatic and gastrointestinal involvement may result in jaundice and enterocolitis, respectively. Involvement of the alveolar capillaries causes noncardiogenic pulmonary edema, which may be exacerbated by fluid retention secondary to renal failure. Oxygen exchange may be further compromised with the development of adult respiratory distress syndrome. Acute renal failure is multifactorial and results from the renal overload of free hemoglobin and malarial pigment, as well as the microvascular compromise and associated hypoxia. Microvascular damage may result in activation of the coagulation and thrombolytic cascades. Disseminated intravascular coagulation exacerbates the hemolytic anemia and further compromises an already insufficient microvascular circulation. Hypoglycemia, common in Plasmodium infections, worsens tissue injury. The causes of hypoglycemia are nutritional, immune mediated, parasitic, and iatrogenic. Inadequate oral intake and parasite use of glucose contribute to hypoglycemia. Immune-mediated mechanisms, such as elevations of TNF-a, may also contribute to hypoglycemia. Therapy-induced elevations in blood insulin, secondary to quinine and quinidine, cause hypoglycemia. In pregnancy, P falciparum becomes sequestered in the maternal sinuses of the placenta. This and the aforementioned complications increase the probability of adverse outcomes for the fetus. Obstetric complications include spontaneous abortion, premature labor and delivery, and maternal death. Transplacental infection of the neonate or "congenital malaria" is rare, but may occur. Primaparas (women pregnant with their first child) are at increased risk for adult respiratory distress syndrome. Pulmonary edema and adult respiratory distress syndrome in pregnancy may be due to the physiologic hypervolemia of pregnancy and an increase in the peripheral vascular resistance after delivery. Pregnancy-associated and quinine-associated hypoglycemia may exacerbate that caused by the parasitosis.